Isaac’s Moving and Storage offer origin and destination services to families and partner moving companies who need local services in the USA. As a premier moving company with over 25 years of experience, our highly trained team have the expertise to provide timely pick-up and delivery to meet your customers’ needs and your commitments. The Isaac’s team is always responsive to special requirements, every shipper’s demand is met, and the smallest detail is accorded full attention to minimize disruption of your shipper’s schedule. Our privately owned and operated fleet of trucks and trailers can provide an in-house seamless and safe transport of your customer’s goods throughout the continental United States. Isaac’s trained teams of movers bring a wealth of experience to packing your home correctly. We focus on packing so that no damage will occur as your good travel the rough seas. A well trained personal coordinator, equipped with the knowledge to export your goods safely, will take you through the process of moving your household goods to any corner of the world step by step. Our partners at US ports provide us with clean containers and ensure the export process is smooth and timely. Your move coordinator will introduce you to our partner overseas and make sure that you have the proper paperwork to import your goods to any country around the world. Our international partner will also assign a personal import coordinator who will work to coordinate with you and to clear your container at the destination port customs and deliver your goods to your new residence. A personal coordinator will explain to you the import requirements and clear your container safely from the US port of arrival. Swift and professional handling will ensure your shipment is delivered to your residence in the USA within 4-10 days of the shipment arriving to its final terminal in the USA. Your personal coordinator will coordinate a delivery date that is convenient for you. We will also take care of any delivery requirements like elevator or parking needs. Our trained crew will unload your goods from the container into your home, assemble dining tables, beds and other regular furniture that don’t require specialist carpentry. The crew will make sure to leave your house clean of any. We strive to provide quality service at a competitive rate. 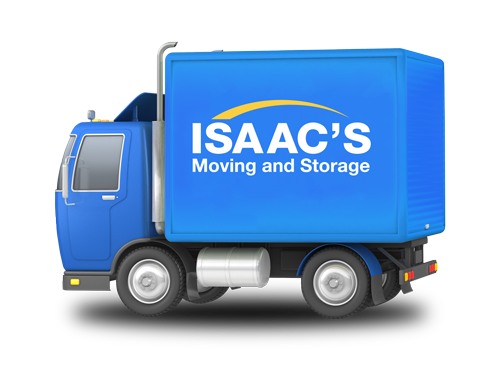 Let Isaac’s Moving and Storage be your choice as an origin or destination partner. For over 25 years, Isaac’s Moving and Storage has been helping families, international businesses, government agencies, international organizations and educational institutions to re-locate their members all around the globe. Our years of experience and attention to detail are the formula for a stress free international move.